New commentary in the latest edition of the International Building Code (IBC), the building code in use or adopted by all 50 U.S. states, clarifies that all installed vehicle lifts must conform with the American National Safety Standard ANSI/ALI ALCTV (current edition) "Safety Requirements for the Construction, Testing and Validation of Automotive Lifts." The IBC is also in use or adopted by the District of Columbia, Guam, Northern Marianas Islands, New York City, the U.S. Virgin Islands and Puerto Rico. All lifts installed in the 50 U.S. states and other areas that use or have adopted the International Building Code must conform with the safety standard ANSI/ALI ALCTV (current edition). Only lifts that have been certified to comply with this standard can wear an ALI Gold Label shown here. "To put it as simply as possible: If you're installing a vehicle lift in an area covered by the International Building Code, you must choose a lift that meets ANSI/ALI ALCTV. In other words — choose an Automotive Lift Institute (ALI) certified lift, or you're violating the IBC," explains R.W. "Bob" O'Gorman, ALI president. "Lift customers and code enforcement officials can easily identify certified lifts by the gold ALI certification label that is applied to every lift that passes third-party testing and achieves certification. 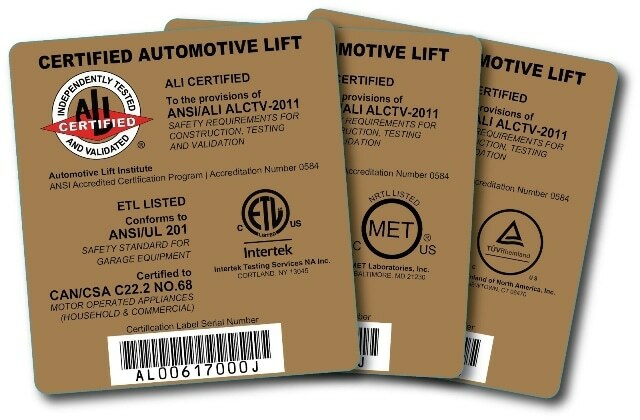 A complete list of certified lifts is available at www.autolift.org/ali-directory-of-certified-lifts." Although the IBC has long covered automotive lifts by reference, there was still some confusion in the marketplace, O'Gorman says. "We've been contacted by many lift customers who had been incorrectly told that the IBC only applies to elevators, not vehicle lifts. The new language in the supporting commentary of the 2015 IBC makes it very clear that building inspectors can enforce the ANSI/ALI standard regarding lifts." From the 2015 International Building Code, Chapter 30, Section 3001.2 Referenced Standards, Commentary: "The enforceability of a standard is established in this section, and applies wherever the provisions of this chapter do not otherwise indicate a requirement. Therefore, even if a standard is not referenced anywhere else within this chapter it will be applicable to such systems and equipment. For example, automotive lifts are addressed by the reference to ANSI/ALI ALCTV, but no further requirements are found in Chapter 30. This standard is fully applicable to such automotive lifts." ANSI/ALI ALCTV is a nationally recognized safety and performance standard covering the construction, testing and validation of vehicle lifts that are used to perform service on cars, trucks, vans and other vehicles. In order to fully comply with the ALI certification program supporting the standard, all lift models must be tested by one of three approved, third-party, OSHA-accredited Nationally Recognized Testing Laboratories. The testing includes listing of the electrical system and validation of the structural integrity of all the lift's systems and components, proper function of its controls and load-holding devices, proper lowering speeds and mechanical overload protection. Part of the testing process involves loading the lift to 150 percent of its rated load capacity and ensuring that no visual deformation of the lift's structural elements or components occurs. Instructional materials and the lift manufacturer's production facility must also meet requirements outlined in the standard. Lifts that are tested by one of the approved laboratories and found to meet all of the requirements outlined in the ANSI/ALI ALCTV standard receive a gold ALI Certified label. ALI's gold label is the only industry-recognized documentation that the specific lift model has been tested and certified to meet the industry's performance and safety standards. Not all lifts for sale in today's market are certified, regardless of country of origin. Therefore, the burden of purchasing and installing lifts that meet ANSI/ALI ALCTV and comply with the IBC rests on the lift buyer. There are no partial, conditional, pending or temporary certifications. A lift is either certified or it's not. And if it's not certified, it doesn't meet ANSI/ALI ALCTV or comply with the International Building Code. Only lifts bearing the ALI gold Certification Label and listed at www.autolift.org/ali-directory-of-certified-lifts are certified. Lifts can only be certified at the time of manufacture. Lifts cannot be retroactively certified after installation. Lift options and accessories are also subject to testing and certification. Use of non-certified options or accessories on a certified lift will void that lift's certification for as long as the original configuration remains altered.